The Tennant T3 is a compact scrubber designed to maneuver into the tightest areas while achieving maximum productivity. This unit will run up to 3 hours on a single charge allowing it to clean up to 70,000 square feet. This versatile machine can be used for daily cleaning, stripping or restoration projects. Note: There is an updated version of the Tennant T3, now called the Tennant T300. Learn more about the Tennant T300. 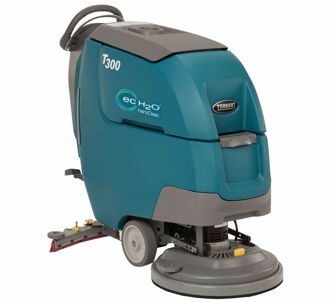 This powerful cleaning machine is quiet and can be used in noise-sensitive environments. At only 68.5 decibels the T3 is about 75% quieter than most machines on the market today. This scrubber can be used in schools, health care environments, and offices at any time. The T3 is easy to take care of. “Hygenic” tanks for both clean and dirty water are completely accessible for easy clean out. A convenient debris strainer in the dirty water tank prevents objects in the dirty water tank from clogging your drains. Brushes and squeegees can be changed in minutes without the use of tools. The squeegee tool is self-adjusting so the T3 will always dry floors quickly. The on-board automatic battery charger and optional maintenance free batteries remove the headaches associated with battery maintenance. The Tennant T3 floor scrubber is available in either Disk (17" or 20") or with Traction Drive (20") models for cleaning your hardest to reach areas.